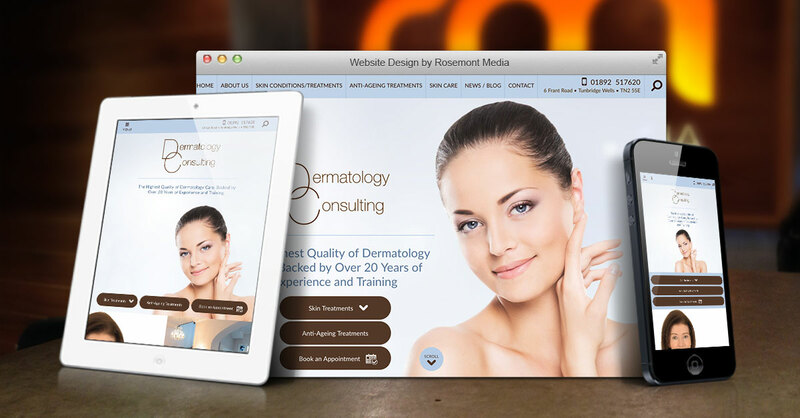 Dermatology Consulting collaborated with Rosemont Media to develop a sophisticated website with a selection of thoughtfully chosen advanced features, including responsive formatting. Royal Tunbridge Wells, UK — Seeking to improve patient access to helpful information, Royal Tunbridge Wells consultant dermatologist Anne Farrell, MD created a sophisticated practice website with the aid of Rosemont Media’s team of designers, developers, and writers. The San Diego, California-based medical marketing firm implemented a responsive design, original photography, and a clean aesthetic to suit Dr Farrell’s specific needs and to highlight her patient-focused approach to treatment. The resulting website has a crisp, minimalist, and modern feel that gives patients unfettered access to a wide range of content on common and complex skin conditions, cosmetic treatments, and practice news. Dr Farrell has extensive training in paediatric skin diseases and she provides an excellent resource on a comprehensive array of concerns children can develop. As a result, parents can locate sought-after medical information conveniently and quickly from their internet-compatible mobile and desktop devices. Patients seeking particulars on anti-ageing treatments and non-surgical cosmetic procedures similarly will find a wealth of information written in a professional yet accessible voice. Dr Farrell offers some of the most advanced rejuvenation options available, including laser skin resurfacing and wrinkle-reducing injectables. Furthermore, finding the website through search engines like Bing, Google, and Yahoo is made easier due to the advanced medical SEO strategies integrated by Rosemont Media. In addition to medical content, Dr Farrell was keen to incorporate identifying elements that set Dermatology Consulting, her Kent-area skincare practice, apart. Her original photography is used throughout the site and showcases the elegant and inviting interior of the brick-and-mortar office. Dr Farrell notes that visitors seeking excellence in skincare can schedule a one-on-one consultation virtually effortlessly through the website’s contact page. To further assist patients in reducing delays, she says individuals can choose to self-refer or go through their general practitioner for an appointment. The practice also works with private medical insurance for those who have it. Every detail is considered, from initial meeting to diagnosis, treatment to final outcome, and Dr Farrell says the upgrade to a responsive website was an essential part of that philosophy. Founded and led by Dr Anne Farrell, Dermatology Consulting is a state-of-the-art dermatology practice in Royal Tunbridge Wells. Offering an expansive selection of treatment options for patients of all ages, the skilled medical team addresses common and complex medical and cosmetic skin concerns using the latest techniques and technology. Located in an elegant Edwardian house, the clinic values a patient-focused approach with transparent pricing, exceptional care, and compassionate treatment. To learn more about Dr Farrell and Dermatology Consulting, please visit dermatologyconsulting.co.uk.